What happens to my content? Can I request it be deleted as well? What if I'm suspended, rate-limited, or banned from posting questions or answers? What will happen to my votes? Will other users be impacted? Why wasn't my account deleted immediately after the timer expiring? What will happen to my pending bounties and close, reopen, delete, or undelete votes? I want my account deleted on all Stack Exchange sites. How do I do this? For more information, see "How do I delete my account?" in the Help Center. If you want to delete your account on a single site, the Help Center explains how. If you have never posted or voted more than once on your profile, your account will be immediately deleted. Otherwise, the account will be scheduled for deletion. During that time, you can cancel the deletion request by visiting your profile and clicking the cancel link in the banner at the top. Otherwise, it will be deleted after (approximately - see below) 24 hours. Following this process on a single site will only delete your account on that site, and will not affect any other site accounts that are linked to your network profile. If you want your account deleted on all sites, see the I want my account deleted on all Stack Exchange sites section below. I can't follow the above instructions to delete my account. What can I do? Suspended users: If you are suspended, you will get an error message when opening the Edit Profile page because you cannot edit your profile while suspended. 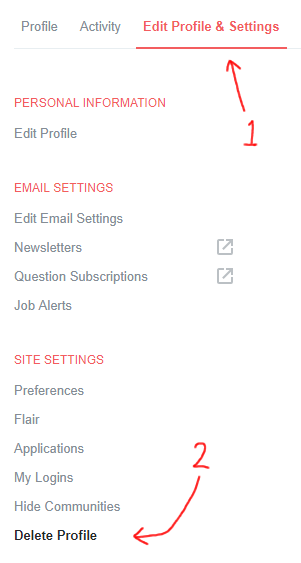 You can still access the Delete Profile subpage though, either through the help center article, by selecting the "I need to delete my user profile" option on the contact page, or by navigating to /users/delete/current on the site you want to delete your account. Area 51 profiles: As Area 51 runs off a significantly older version of the Stack Exchange software, the ability to delete your own account is not implemented there. You may request deletion of your Area 51 account by using the contact form there (click the "Other" option). Why is there a 24-hour timer for deletion? The 24-hour waiting period exists to better emphasize that deleting your account is final - you cannot later request that your account be restored (see the next section). To prevent people from "rage-quitting" and regretting it later, the system provides a final opportunity to decide against deleting one's account. What happens to the reputation and badges I've earned? Can I request my account be restored? All reputation and badges you've earned on your account will be erased. Posts will generally not be deleted, but will be dissociated - i.e. will no longer be "owned" by an account, so you will cease to have special privileges on them. Any votes on your posts will no longer earn reputation for any account, though other users can still start and award bounties on them. Content you've posted on the site is owned by you, but licensed to Stack Exchange, and you therefore cannot request that it be deleted with your account. Your posts will be effectively dissociated from your account; your username will no longer show on them, but it will instead show your denormalized username (e.g. "user123456" where 123456 was the user ID of your account). Will deleting my account clear any restrictions placed on my account? Unfortunately, deleting your account while you are suspended by a moderator or rate-limited or banned by the automated quality filter will not remove any restrictions placed on your account. They will simply be re-applied to any new accounts you create. If you did cast a lot of votes, your votes may be kept (or more accurately, moved to the Community user) to prevent high-impact, widespread changes to other users' reputation. See the next section for more info. Accounts are not deleted immediately after the timer expires, but by a scheduled task that runs once an hour. Thus, you may see a notice that says "this account is scheduled for deletion [x] minutes ago", e.g. "5 minutes ago". This is intentional and by design; your account will be deleted within an hour of the timer expiring. If your account has cast a lot of votes, it will not be deleted approximately after the 24-hour timer expires, as above. Deletion will be held up while a developer checks your account for evidence of voting fraud (to see if you qualify for preserving votes, per the section above). During this hold-up, you may see a deletion notice that says that your account is scheduled to be deleted for some date in the past; this is confusing, but not a sign of a bug. If your account has not been deleted and it's been more than three business days (weekdays, excluding U.S. holidays) since the timer has expired, it's possible that the team simply has not cleared out the queue of accounts awaiting deletion; send a contact request using the "contact" form to remind them. If you had any pending bounties or votes while your account is deleted, those will be moved to (owned by) the Community user. In the case of bounties, you can no longer manually award them and they will be awarded automatically at the end as they normally would. You will have to request deletion of your account on every single site on which you have a profile individually. As a matter of policy, the SE team does not process deletion requests manually anymore (except for the case of Area 51 profiles where users cannot use the normal procedure, and deletion requests from high-rep users which are automatically fielded to developers to potentially preserve votes, which requires no separate intervention from the user unless it's been more than three business days since the deletion timer expired). Your network profile on stackexchange.com will be automatically deleted within 24 hours (whenever it attempts to sync again) unless you have ever manually logged in directly on stackexchange.com - in that case, you have a physical profile there and it will need to be deleted by staff. Contact us using the "Other" option and we'll get it deleted. Your old username will continue to be visible in comments that reply to you, as well as in the Stack Exchange Data Explorer until it gets updated at the end of the week and in monthly data dumps published when your account was active. Unless your votes were preserved, users will lose the +2 rep awarded to them if you were the final user to approve one of their suggested edits. This is an anti-abuse feature. We used to automatically cull old, inactive accounts after 6 months as documented on the blog (When is an Account Abandoned?). However, we briefly stopped culling inactive users on May 3, 2017. Note that as of May 2018, there was an announcement that inactive accounts would once again be culled, this time after two years; this will be rolled out in June 2018. How can I delete my Stack Exchange Data Explorer account? Not the answer you're looking for? Browse other questions tagged support faq user-accounts deleted-accounts . Why can't I delete my account on my own? How do I delete my account and associated posts on a specific site? How do I remove one's self from a community? Is it possible to delete my profile along with the things I posted from SO and other SE sites? How do I delete my entire Stack Exchange account? How to delete my account from Area51? Can Moderators please delete my account?